General TV Channel / Himshikhar Television is a private television station based in Damak, in the Eastern Region of Nepal. 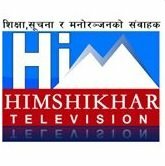 Himshikhar Television is in Chairmanship of Dhruba Prasad Neupane. The station started full phase broadcasting on January 19, 2011, under a terrestrial and cable television transmission license. The channel aims to promote the Eastern Development Region and its local businesses. It has offered programming on human rights and social issues, highlighted tourism places and area of prosperity, along with analysis on aspects of economic development in the Eastern Development Region.